Character makes a man. We are not judged by our wealth, health, status in the society or positions which are all short lived. A man may earn reputation through his other acts but when the character falls, everything goes in vain. 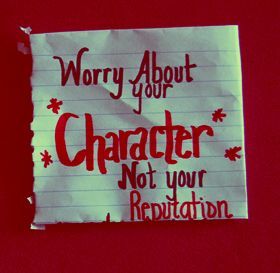 Abraham Lincoln once said, “Character is like a tree and reputation like a shadow. The shadow is what we think of it; the tree is the real thing”. Only our character decides our true self and if it is good, will remain forever for many more years to come. In fact, it is very easy to judge the character of a person. Mark Twain says, “A man’s character may be learned from the adjectives which he habitually uses in conversation “. All people have Dr. Jekyll and Mr. Hyde in them and it is only when Hyde takes a hide and Jekyll comes out predominantly, the character is worth mentioning. Here are interesting quotes on character and share them with your friends.